The other day I was crapping on talking to my wonderful husband about something inane very important. The following conversation ensued. Me: Do you sometimes wish you hadn’t married me? Yak: What did you say? Me: I just asked, do you sometimes wish you hadn’t married me and you said yeah! Yak: Oh, I wasn’t listening. Me: Are you embarrassed now? Yak: No, I’m just normal. Despite many conversations like this, I continue to feed my vegetarian coeliac husband. (I know, I am an awesomely forgiving and kind human being). This ain’t my recipe folks. Straight up. It’s borrowed, stolen, nicked, knocked off from the wonderful Sneh Roy and her Cook Republic blog. 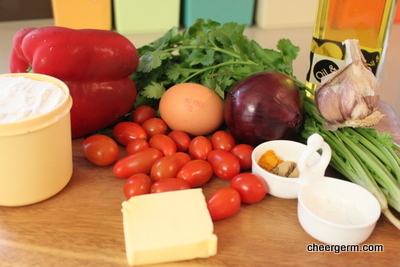 Hence, I have provided my photos then linked to her fabulous recipe afterwards. 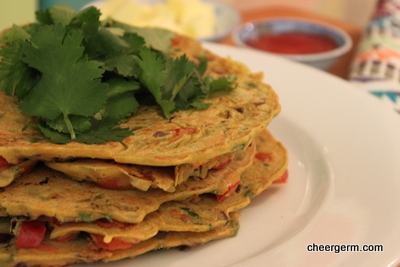 These buckwheat omelettes are pancake like and have an Indian twist. 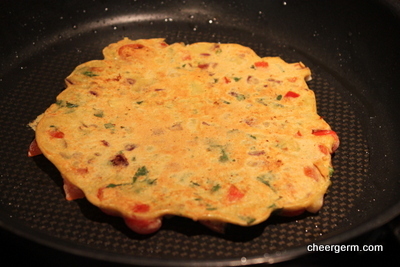 They are a well tasty brunch, lunch or light dinner option. 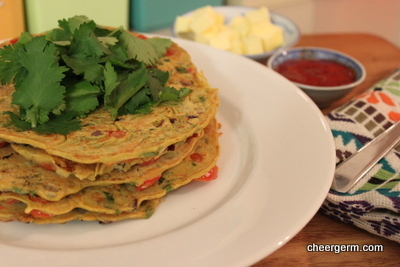 We adore the fresh and light coriander burst they provide. Many of you may already be aware of this but I just wanted to share a wee cheffy hint given to me many moons ago by a real life cheffy type person. 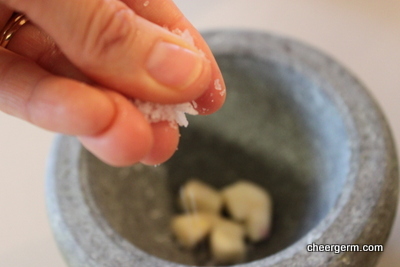 When dicing, chopping, crushing, squashing, pestle and mortaring garlic, always add a big pinch of salt to help ‘bring the garlic down’. (By this I don’t mean to depress the poor member of the onion family with pithy and personal put downs. ‘Yeah garlic, you are so much more stinky than your other close relatives’.) 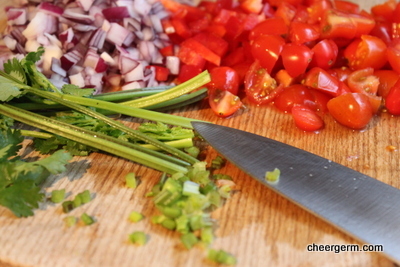 Adding the salt helps the garlic to release it’s delicious oils and also stops it sticking to your knife. Cheergerm adaptations to this excellent recipe include bumping up the salt to 1 tsp sea salt, using 1/2 teaspoon ground ginger powder as I had no fresh ginger, adding 1/4 diced red pepper and 100g cherry tomatoes (as I didn’t have any big tomatoes) Also, as we didn’t have fresh chilli, I used sweet chilli sauce and tomato sauce mixed together as the accompanying sauce. 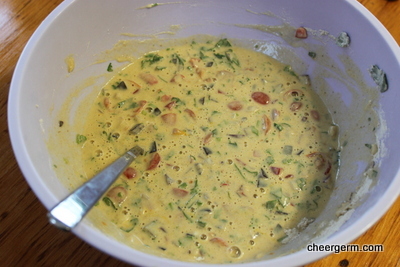 Here are my photos, I have given a link to the recipe at the end. Once you have visited Cook Republic, you may never leave. 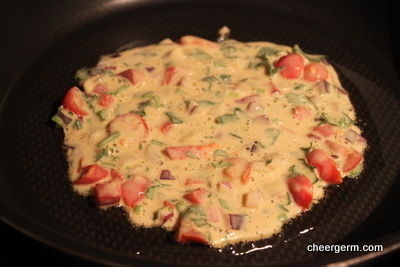 This entry was posted in Gluten free main courses, Vegetarian and tagged buckwheat, buckwheat flour, cheergerm, Cooking, coriander, food, gluten free, gluten free omelettes, gluten free pancakes, recipes. Bookmark the permalink. How funny – I was just making buckwheat pancakes nicked from Elizabeth David’s English Bread and Yeast Cookery, which, you can probably tell from the title, had yeast in them. I love all the Indian additions to this – makes it a whole meal. Lucky Husband! Firstly, love the dialogue. Secondly, your husband’s stomach should be extraordinarily grateful for your heart. And I am totally psyched to try this awesome looking recipe. Cannot wait, as the pictures are mouth-watering! Heheh. I love those conversations. Me and Jennee have them all the time! And the pancakes look effing hot, too. Smiley face. They are a tasty treat, yes indeedy Mr F! Glad to hear that there are many of us enjoying these annoying and funny conversations in our relationships. Big grin. My husband and I accuse each other of not listening … all the time! Married life! I couldn’t stop laughing when i read that! How funny. You were probably mortified in the moment though!